If only we could narrow it down to just three things to know about volunteering abroad! Every year, more than 2000 people volunteer from Ireland in other countries around the world. Most of them (85%) volunteer for four weeks or less, and many go to Sub Saharan Africa and south east Asia with countries like Tanzania, Uganda, Cambodia and Viet Nam being the most popular destinations. Comhlámh is the association of volunteers and development workers and one of the things we do is provide information to people who are thinking about volunteering overseas. We try and encourage responsible and responsive volunteering practices. But what is that, and how do you know if you are being responsible and responsive? A potential volunteer may have all the best intentions in the world, but how do they know if the volunteering experience is going to be mutually beneficial to the host community and project? The first thing to know would be this: a potential volunteer should only volunteer overseas with a volunteer sending agency that has signed-up to the Comhlámh code of good practice for volunteer sending agencies. This code is a set of standards used to ensure responsible and responsive volunteering practices over 11 principles, including the pre-departure to post-return stage. This code tries to ensure that the volunteer sending agency is working in partnership with, rather than in charity for, a locally based organisation with expertise in the field. This code tries to ensure that the local organisation has requested a number of volunteers to visit, from a number of disciplines and fields, so that the experience is mutually beneficial and that there is an element of learning and discovery to it. That would be the first thing to know. Once a potential volunteer has found the list of 40 plus agencies, they must then think about their own motivations for volunteering and give serious thought to the when and the where and the why of the volunteering experience. The majority of volunteers are away for four weeks or less, so it is very important that the overseas project is just a small part of a larger programme that should last about a year. Some of the best volunteer sending agencies recruit volunteers in the autumn, and spend the year working on team building exercises, engaging in pre-departure training which examines development as a whole and the volunteering aspect as a part of it, rather than just the logistics and operational parts of the information needed before the trip. These sending agencies then go away for four weeks (or less) but have a very important debriefing session about a month after return to Ireland, and Comhlámh views this debriefing part of the volunteering experience as one of the most important components. Without debriefing, there is no moving forward. 3. How much is it going to cost? Finally, the third thing to know is all about the money! Yes, the short term volunteering projects expect people to raise funds to financially support the overseas experience. But this money is spent on the following; return long haul flights, accommodation, food, insurance and a percentage will go to the host organisation. This will cover some salary costs in the country you are volunteering or any extras that the organisation needs to spend, in order to support the volunteers while they are there. The longer term volunteering options usually pay for the volunteer to live in the country. It will be a small amount, but possible to live with. But this is something to know, and something important to find out about before you make a decision to volunteer. So much to do, so much to think about, so much to know. Which is why Comhlámh attends a number of outreach events throughout the year. We go to campus volunteering fairs, and union conferences, we have stands at international days and diaspora fairs. If you can’t make it to one of those events, you can contact our office and make an appointment for one of our one-to-one information sessions. Email us today, for further information about your volunteering options, and all the things you should know, before volunteering abroad. Special thanks to Ruth Powell of Comhlámh for this #3thingstoknow feature on volunteering abroad. For more on what to consider about volunteering abroad and the work of Comhlámh, see comhlamh.org. 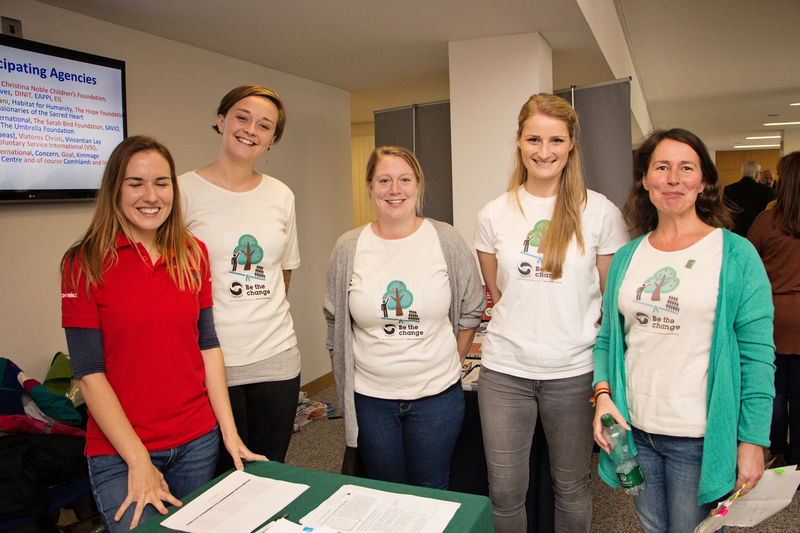 Pictured above are Comhlámh staff at the 2015 Irish Aid Volunteering Fair.